Why Choose BR for your Home Inspection? A home is probably the largest purchase you will ever make, so it is important to understand the condition of your investment. While the inspection is not a prediction of future conditions and cannot reveal every concern, choosing a certified professional home inspector will significantly reduce your anxiety by arming you with the knowledge you need to make an informed, confident decision. BR is certified through InterNACHI the top inspector association. BR provides prompt support to you before, during, and after the inspection. You’ll get reminders before your inspection and communications after so you feel secure. Your inspection will provide great value to you. Our prices are competitive. Your inspection includes a detailed report so you know what issues to address. A BR Inspection includes a free Home Maintenance book, and a helpful HomeFax report. All home inspectors are the same, right? WRONG. This guy is the best inspector I have worked with in my career. He was on site the entire evening with the owner of my company, meticulously documenting and gave advice on every single issue this building had. Absolutely top notch company to use for home or business inspection. Bill emailed us a very detailed report within 24 hours (on a weekend, no less!) and clearly indicated what items needed addressed immediately or as part of regular home maintenance. We also received a helpful guide of what we should be keeping up with on a routine basis. The report and service that Bill provided was thorough and knowledgeable and more than worth the cost. Thank you so much Bill. I wish every service provider would communicate as great as you have! Call 330-333-0783 to schedule your BR inspection! BR performs inspections in the Youngstown, Warren, and Salem metro areas. If your property falls outside the service area, don't worry - BR can accomodate many other areas in Ohio. If BR misses something on your inspection InterNACHI will buy back your home. 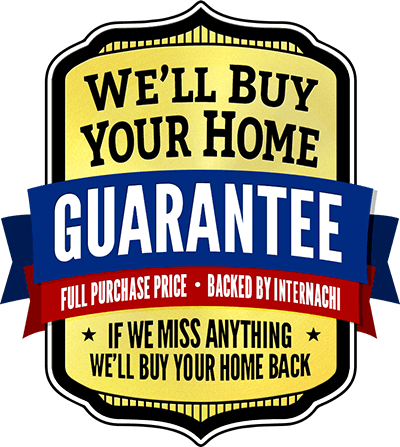 Yes, you read that right…InterNACHI (the International Association of Certified Home Inspectors) will buy it back from you for the price you paid. There are time limitations and restrictions, but this gives you the peace of mind while making your home buying decision.